British-Israel.us - Lesson 26 - Christianity Before Christ? Why are there so many accounts of crucified "saviors" prior to Jesus the Messiah? Why are they so similar to the Gospel accounts even in minor details? Is Christianity merely a counterfeit of a more ancient savior-legend? Originally, all nations dwelt together in a common society at Babel about 2300 B.C. This would account for the close similarity of all branches of pagan religions. Noah preached (2 Pet. 2:5) about a coming Savior (Gen.3:15) who would be born of a virgin, live a sinless life, be crucified, die (Rev. 13:8) and live again. Perhaps he received this knowledge from the gospel in the stars -- unless it was passed down from Adam generation to generation. But in any case, we actually find the gospel in Genesis 5 by simply listing the ten men's names and their meanings from Adam to Noah. Notice: Adam (Man), Seth (is appointed), Enosh (mortal), Kenan (sorrow). Mahalalel (The blessed God), Jared (shall come down), Enoch (teaching). Methuselah (His death shall bring), Lamech (the despairing), Noah (rest or comfort). Is God telling us that the pre-flood world heard the Gospel? We think so. Naamah-Isis, Noah's wife (where we got our word "nemesis"), corrupted and institutionalized this theme into human sacrifice and cannibalism. Then God scattered mankind at the tower of Babel. The people of India wrote the Hindoo Baghavat Gita about Krishna who was supposedly crucified in 1200 B.C. and the Syrians wrote about their "savior" Tammuz whom they say was crucified 1160 B.C. and the Mexicans mentioned their Quexalcotel 587 B.C. and the Greeks their Prometheus (547 B.C.) as told by Seneca and Hesiod. The Persians also had their "savior" called Mithra and they claim he was crucified in 600 B.C. God, born of a virgin, crushes the serpent's head but suffers death from its venom. This is a common tradition in all nations. For many more examples, see L 'Origin des Cults by Depuis; or Forerunners and Rivals Of Christianity by F. Legge; or see Pagan Resurrection Myths and the Resurrection of Jesus by Leon McKenzie; or Deceptions and Myths of the Bible by Lloyd M. Graham, or the Golden Bough by James Frazer; or see The World's Sixteen Crucified Saviors by Kersey Graves. Each society annually in the spring commemorated this event with the sacrifice of the king's firstborn son on a cross to ensure crop fertility. The victim's flesh was eaten and his blood drunk. Originally the stars were intended by God to "be for SIGNS" of the Zodiac (Gen. 1:14). God calls all the stars "by their NAMES" (Ps. 147:4). He told Abraham, "Look toward heaven and recount the STORY of the star NAMES in order. They will tell you about your descendant " (Gen. 15:5). Furthermore, each of the twelve signs was associated with one of the twelve tribes of Israel (Gen. 37:9-11; Gen. 49 ; Deut. 33). This is NOT ASTROLOGY (Isa. 47:13-14). Deuteronomy 4:19 condemns astrology which is defined as "WORSHIP" of the sun, moon and stars. Psalm 19:1-4 says, "The heavens declare the glory of God; the skies proclaim the work of his hands. Day after day they pour forth speech; night after night they display knowledge (using sign language). They have no (verbal) speech, they use no (vocal) words; no sound is heard from them. 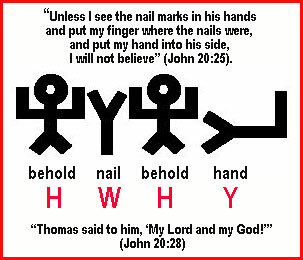 Yet their voice (sign language) goes out into all the earth, their (picto-graphic) words to the ends of the world." Yes, "By his Spirit he hath garnished the heavens; his hand hath formed the crooked serpent (Drago Constellation)" (Job 26:13). God made the zodiac (Job 9:9). Josephus tells us that righteous Seth invented astronomy (Ant. 1:2:3). Yes, "their sound went into all the earth" (Rom. 10:18). In Acts 17:27-28, Paul quoted from Aratus's poem Phaenomina written about the constellations around 270 B.C. It was these STAR NAMES that "preached the gospel unto Abraham" (Gal. 3:8). Ancient Egyptian zodiacs such as the one in the Tombs of the Kings at Karnak have the image of a sphinx (woman's head with lion's body whose name means "bind together" from Greek "sphiggo") between Leo and Virgo showing where the circle begins and ends. In the zodiac of Denderah (2000 B.C., a picture of a sphinx is also placed between Virgo and Leo. But how can we understand this sign language? Start reading at Virgo with the brightest star in that constellation and end with the faintest star. Then move to Libra and do the same. Etcetera. When the names are put together into a sentence in order of each star's brightness, a sentence is constructed for each constellation. The constellations begin with our Lord's birth from VIRGO (a virgin) and end with His return as the "LION of the tribe of Judah." "Thy will be done on earth as it is in (the astronomical) HEAVEN" (Matt. 6:10). We are instructed to "measure the (360-degree celestial) temple of God" (11:1) counting degrees clockwise. The original meaning of the zodiac was that a Virgin (Virgo pregnant with sun) would give birth to a son of God pictured by the actual sun as it passed through her body. Divine scales of justice (sun in Libra) would require His death (Scorpio's sting is orange swelling sore) for the sins of humanity. But the dual-natured Savior would conquer death (Sagittarius' face shining like the sun) and give life to his followers (a living fish) by his sacrifice (Capricorn goat a burnt sacrifice) and let them drink the living waters of the Holy Spirit (Aquarius pouring out the sun) which then breaks the bands of sin (sun cutting Pisces' bands) because the Lamb was wounded for our transgression (sun wound in Aries' side). He will return (Taurus with golden sun crown on his head), this dual-natured Savior with fiery words (Gemini), and shelter his people (sun in Cancer) from the day of Wrath when this "Lion of the tribe of Judah" will destroy that old serpent the Devil (Leo pouncing on Hydra). Even the names of Abraham's sons indicate a knowledge of the Gospel prior to 1900 B.C. The order and meaning of the names of the sons: "See a son (Reuben), hear him (Simeon), join him (Levi), praise him (Judah), dwell with him (Zebulun). He will reward (Issachar), at the judgment (Dan), in a company (Gad) of blessed ones (Asher), who have wrestled (Naphtali) and been added (Joseph) to the son of my right hand (Benjamin)." In primitive days it was the custom in many lands for a KING or ruler to put his own SON to death as a sacrifice to the tribal god. God tested Abraham in this way. Abraham attempted to sacrifice his SON Isaac (Gen. 22:1-19). Arab legend says Ishmael was nearly sacrificed by his father also (Weil's Biblical Legends of the Mussulmans, p.62). Moses actually taught the substitution of a lamb for the FIRSTBORN SON (Ex. 34:20). King David attempted to stop a famine by sacrificing seven princely SONS of KING Saul, and hanging them up before the Lord (2 Sam. 21:9). KING Mesha of Moab sacrificed his ELDEST SON (2 Ki. 3:27). KING Hiel sacrificed his SONS at the foundation of Jericho (1 Ki. 16:34). Both KINGS Ahaz and Manasseh incinerated their SONS in sacrificial fire (2 Ch. 28:3; 33:6). The Carthaginians, who originally came from Syria, also had this custom: Hamilcar sacrificed his SON at the seige of Agrigentum (Diodorus 13:86) and Maleus, a Carthaginian general, crucified his SON as a sacrifice to Baal (Justin 18:7). Maleus dressed up his SON as a ROYAL personage before crucifying him. Philo of Byblus says it was customary for the KING to give his beloved SON to die for the nation as a ransom offered to the avenging devils. The words of the prophet Micah may be taken as the custom of that day: "Shall I give my FIRSTBORN for my transgression, the fruit of my body for the sin of my soul?" (Micah 6:7). King David HANGED the sons of king Saul "at the beginning of the barley harvest" and this harvest begins in the plain of Jericho and in the Jordan Valley, at about the time of PASSOVER (2 Sam. 21:9) showing a connection. Victims were sacrificed with mystic rites (Eusebius Preparatio Evang.1:10,29). Lent? Sunrise services? Easter eggs? Hot cross buns? Porphyry tells us that Phoenician history is full of such sacrifices (De Abstinentia 2:56). A certain Jesus ben Pandira was stoned to death and HUNG up on a TREE on the eve of PASSOVER in the reign of Alexander Jannaeus about 100 B.C. Thus there is reason to suppose that the ancient custom of human sacrifice of a King's son performed annually at the SPRING FESTIVAL survived in modified form with the execution of a condemned criminal dressed up like a King at this PASSOVER time. (More on this later.) This would account for Caiaphas' remark that it was expedient, presumably at PASSOVER time, that a man should be sacrificed for the good of the nation (John 11:50,55). In this regard it is interesting to notice that the writer of Acts generally speaks of Jesus as having been slain and then "HANGED on a TREE" as though this were a common phrase coming readily to his mind (2 Sam. 21:9; Josh. 8:29; 10:26; etc.). 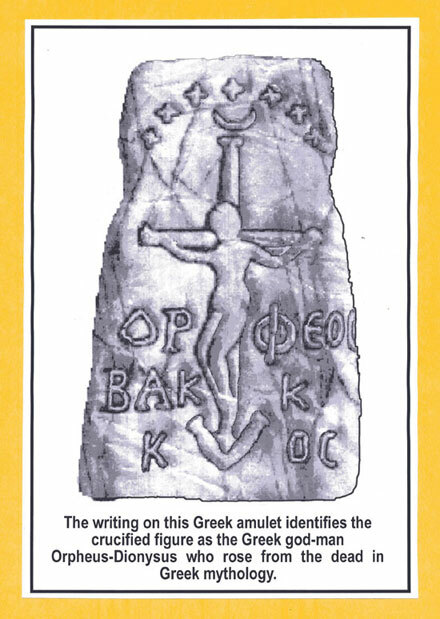 and the word "HANGED" is frequently used in Greek to denote CRUCIFIXION (Frazer's Golden Bough 1:226, note). In the holy groves of Upsala men were sacrificed by being HUNG up on the sacred TREES (Adam of Bremen, Descriptio insularum Aquilonis, 27). The ancient Gauls CRUCIFIED the human beings sacrificed to their gods (Strabo 4:4:5). Called By The Title "Bar Abbas"
The king was, in early times, usually regarded as a personification of the tribal god, and hence as the divine FATHER of his people, and his SON who was sacrificed was thus the "Son of the Father" or "BAR ABBAS" in Hebrew. This would explain the curious Gospel story of Barabbas. Frazer pointed out "BARABBAS" was certainly not the personal name of any one criminal, but was the traditional name for the victim in an annual human sacrifice or criminal execution as the case may be. Philo Judaeus (Against Flaccus ch. 6), writing in the days of Agrippa, about 40 A.D., tells us that the mob at Alexandria dressed up a crazy old man, putting a sham crown on his head, a scepter in his hand, and a purple robe over his body, and hailed him as KARABBAS, an obvious miswriting for BARABBAS, and as Maris, the Syrian word for a royal personage. Although only one man represented the actual Bar Abbas, it must have been usual to sacrifice others with him; for it was customary in primitive days for an important person to be accompanied at death by SERVANTS who must therefore also die in order to attend him in the next world (Herodotus 4:71). Thus, TWO MEN were crucified with Jesus, one on his right and one on his left. Moreover, in a fragment of Ctesias, it is recorded that the Egyptian usurper Inarus was crucified by Artaxerxes I between TWO THIEVES; and a Persian saint, Hitzibouzit, of unknown date, is said to have been "offered up as a sacrifice between TWO MALEFACTORS on a hill-top facing the sun" (Conybeare, Apology and Acts of Appolonius, p.270). By the time the Romans came along, the spring festival had exchanged the king's son for an annual mock-king where a criminal was made into a human sacrifice to ensure crop fertility. CRIMINALS condemned to death were SUBSTITUTED for the royal prince. Thus in the Babylonian Sacaea a CRIMINAL was dressed up in royal robes to represent a prince, a crown being placed on his head, and was scourged and then crucified or hanged (J.M. Robertson, Pagan Christs, p.145). At Rhodes a CRIMINAL was similarly sacrificed at the Kronian festival (Porphyry De Abstinentia 2:54), in commemoration, obviously, of the sacrifice by Kronos of his royal son Ieoud. In the Kronos legend Ieoud was dressed in royal robes before being sacrificed. The victims of these human sacrifices were generally crucified, or else killed and then "hung on a tree," as in the various hangings before the Lord mentioned in the Bible (2 Sam. 21:9; Josh. 8:29; 10:26; etc.). Even the "Lord of Misrule" in Medeival England's December 25th celebrations and "King of the Carnival" or "Rex" in today's Mardi Gras in New Orleans can be traced back to this human sacrifice in the primitive fertility rite at the turn of the year, ensuring that the soil would continue to be productive (Celebrations by Robert J. Myers). One of the Saturnalia amusements was the election of a mock king (Tacitus Annals13:15; Arrian Diss. Epictet. 1:25; Lucian Saturn. 4) which recalls the characteristic ceremony of twelfth-night. 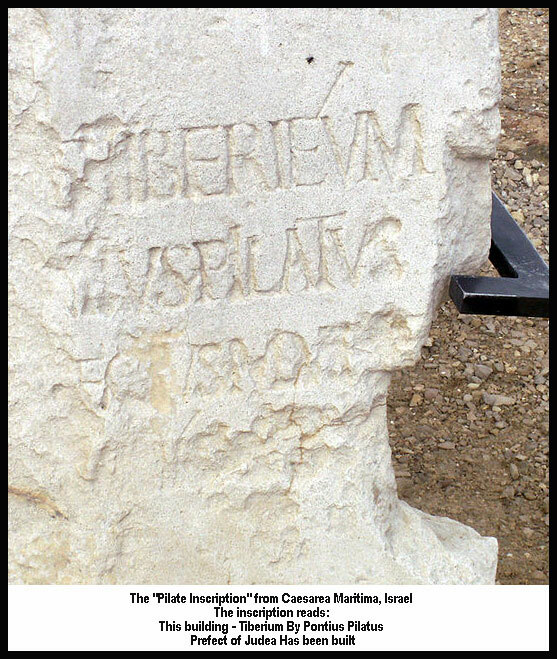 Palestine, like other provinces of Rome, practiced a custom where a criminal was sacrificed in place of the primitive royal "Son of the Father" or Bar Abbas. The significance of dressing up our Lord as a king, and of the inscription "The King of the Jews," and the mock crown of thorns and a mock scepter in his hand all become apparent. More proof is the peculiar fact that he was executed by crucifixion when the punishment for blasphemy and heresy was death by decapitation (as in the case of John the Baptist) or stoning. The execution took place on the eve of Passover, yet crucifixions were slow torture often lasting several days before death released the sufferer. Thus the fact that an ordinary crucifixion would be held over till after the festival makes this crucifixion very unusual. Even more unusual is the fact that two criminals were crucified with him. Finally the release of a condemned criminal "Barabbas" whose place he took. Those who argue that the Gospel story of the crucifixion is too similar to previous ancient pagan accounts of human sacrifice to be believed are misinformed. That is the very reason it is genuine and authentic. It was human sacrifice exactly as the pagan rituals had practiced it for thousands of years. The name "CANNIBAL" (Cahna Baal) is another word which means "Baal Priest" The literal meaning of BONFIRE is "BONE FIRE" [M.E. bonefyre, bone fire, later funeral pyre] because such a ritual fire came from the SACRIFICE of HUMANS. In Jeremiah 19:5-6 we read, "They have built also the high places of Baal, to BURN their SONS with fire for burnt offerings unto Baal which I commanded not, nor spake it, neither came it into my mind: Therefore ... this place shall no more be called Tophet, nor the valley of the son of Hinnom, but the valley of slaughter." The victim was crucified and then his FLESH was EATEN and his BLOOD DRUNK by priests of Baal known as Cannibals. The priests of Baal killed children (Isaiah 57:5; Ezekiel 16:20; Tertullian Apologetics 9; Horace Epod. 5; Procopius Gothica 1:25; Pausanias 9:8). Minucius Felix said that ""Even the Romans worship Jupiter Latiaris with manslaughter" (Octavius p.108). Pliny praises the Roman people for "having put an end to those monstrous rites" in which "to murder a man was to do an act of the greatest DEVOUTNESS, and to eat his flesh was to secure the highest BLESSINGS of health" (Nat. Hist. 30:4). Instead they called bread Ceres and wine Dionysos (Cicero De Nat. Deor. 3:16). A pagan COMMUNION. Possibly following the same theme of cannibalism as practiced by the surrounding nations with their yearly mock-kings who were eaten, Jesus himself endorsed the ordinance for only himself by saying, "He who EATETH my FLESH, and DRINKETH my BLOOD, hath eternal life" (John 6:53). Jesus lost many disciples who were offended by this remark (John 6:66) because they thought he was now creating another cult of human sacrifice and cannibalism. But the same Eternal who in Revelation 22:16 called himself "the bright and MORNING STAR" rather than the "goddess" ISHTAR and who calls himself the "BRANCH" (Zech 3:8; 6:12) rather than the Ivy branch of BACCHUS (Hesychius p.179); the same Eternal who employed a FISH to transport Jonah onto a beach of Fish-worshipping Ninevites to show He was more powerful than DAGON; the same Eternal who created "a thick DARKNESS in ... Egypt" (Ex.10:22) to show that he was greater than the Egyptian Sun-god RA whose name He then took: "Sun of righteousness ... with healing in his wings" (Mal. 4:2) and the same Eternal who in Psalm 68:4 "RIDES on the CLOUDS" rather than BAAL of Canaanite Ugarit text mythology who claimed this ability, now may have used the cannibalistic human sacrifices of pagan, crucified "SAVIOR" kings to further illustrate that He ALONE is the king who can SAVE. The Book of Revelation used Chaldean "ASTROLOGY" throughout and turned it to the glory of God. Is there any evidence, outside the Bible, that Jesus Christ really lived? "the brother of Jesus, who was called Christ, whose name was James" (Antiquities 20.9.1). Josephus called	John	the	Baptist	" the good	man"	(Antiquities, 18.5.2). Scholars recognize the genuineness of Josephus' account concerning the death of James, "the brother of Jesus who was called Christ" (Antiquities, 20.9.1). 2.) Justin Martyr, a second-century theologian, wrote: "Now there is a village in the land of the Jews, 35 stadia from Jerusaiem, in which Christ was born, as you can ascertain also from the registries of the taxing under Cyrenius your first procurator in Judea" (First Apology, chapter 34). Justin was referring to public records that existed in his day to demonstrate that Jesus was born in Judea. Of course, one would expect that a religionist such as Justin would naturally support Jesus' authenticity as a historical person. But what about a historian who despised Christians? 3.) Cornelius Tacitus, a Roman senator, consul, governor of the province of Asia, and historian, referred to 'Christus' and his execution by Pontius Pilate in his Annals (written ca. AD 116), book 15, chapter 44. (cf. Luke 3:1; 23:24,33) The very negative tone of Tacitus' comments on Christians make the passage extremely unlikely to have been forged by a Christian scribe. 4.) We	also	have	the	testimony	of another Roman, the fourth-century emperor Julian the Apostate (so called because he turned from Christianity after being brought up in it). He wrote a major work against Christianity in which he said this: "Jesus, whom you celebrate, was one of Caesar's subjects. If you dispute it, I will prove it by and by; but it may be as	well	done	now. For	yourselves allow, that he was enrolled with his father and mother in the time of Cyrenius.... But Jesus having persuaded a few among you, and those the worst of men, has now been celebrated about 300 years; having done nothing in his life-time worthy of remembrance; unless anyone thinks it a mighty matter to heal lame and blind people, and exorcise demoniacs in the villages of Bethsaida and Bethany" (quoted in the polemic of Cyril of Alexandria against Julian, Cyril Contra Julian, vi, pages 213, 191). If Julian could have demonstrated that Jesus was not an authentic figure, he would have done so. Instead, he asserted that the proof that Jesus was one of Caesar's subjects was still available (the census records were apparently still in the imperial archives). Rather than denying that Jesus performed miracles, Julian	simply	down played	these miracles as not being a "mighty matter." 5.) Jesus is also mentioned in the Talmud. The Jewish Encyclopedia terms as a mere "subterfuge" the attempt of atheists to deny those talmudic references that apply to Jesus of Nazareth. In the Talmud, Jesus is called "Son of Pandera," which obscures that He was born of a young virgin. Pandera, a word meaning "panther" or "leopard," is an anagram for the Greek word parthenos,	meaning	"virgin." The reference makes Jesus, figuratively, the son of a panther or leopard (the Greek word for "panther" is panther, which Jewish usage corrupted into the form pandera). The Talmud subtly calls the Gospel that Jesus preached an avengil, meaning a "blank paper," rather than referring to Jesus' message by the original word evangel, meaning "good news." Jesus brought the good news of the coming Kingdom of God! There are records of Jesus healing the blind, the halt and the leprous. The Talmud also mentions His walking on the sea. Jesus' miracles were not denied by the Jews. Instead, those who saw Jesus perform those miracles said He learned sorcery in Egypt. Jesus is called "dead dog," "the hanged one," " the sorcerer," "Balaam" and "Seducer." Notice the similarity between some of these epithets and the accusation in Matthew 12:24.